London has again come top of the list of the most expensive places in the world to rent an office. 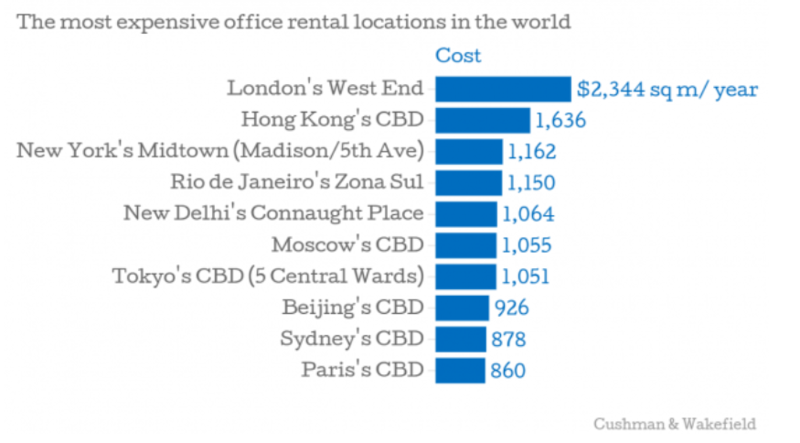 According to the findings of Cushman & Wakefield’s annual report on global office space, the average price of West End offices is more than $2,000 (£1,300) per square metre per year in 2014. As reported by CityAM, this is a 4.6 per cent increase on 2013 prices 3 prices. The London capital has retained its leading position despite slower growth than the global office rental market, which increased by around 7 per cent year-to-date December 2014. Despite coming top of the league again, London office rents are still 13 per cent lower than their pre-“credit crunch” peak in 2007. According to Cushman & Wakefield the London capital is likely to retain its leading position going forward with further growth expected this year in a more than healthy rental market and a fast growing UK economy. Hong Kong retained second place in the study, while the New York rose two places to rank the third most expensive office location in the world. The study suggests that the biggest rise in global occupancy costs came in Dublin, Ireland, with a 26 per cent rise in 2014, with Dublin rising six places in the ranking.